Publisher Coastal Conservation and Education Foundation, Inc.
Abstract DESIGNING AND PLANNING A NETWORK OF COMMUNITY-BASED MARINE PROTECTED AREAS is an educational manual designed for coastal resource management practitioners in the Philippines. In order to develop effective networks of marine protected areas, it is critical that such practitioners have access to the guiding principles of network governance and related science. Ecosystem-based management (EBM) has emerged as a new paradigm in marine resource management. Developing networks of marine protected areas to achieve the goals of EBM is becoming a global effort. However, scaling up governance to encompass holistic ecosystems presents challenges to community based management efforts in the Philippines and other tropical and decentralized contexts. This manual was informed by and designed to aid the ongoing process of MPA and MPA network development in the Philippines. The MPA network design principles in the guidebook have wider applicability and could be extracted to apply to tropical marine ecosystems and management contexts elsewhere in the world. 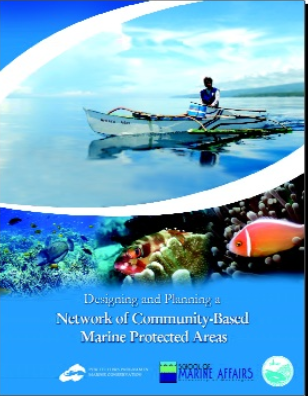 The content of this manual is based on research findings from the culmination of two years of research by a Filipino and international group of inter disciplinary researchers and graduate students in Bohol and Southeast Cebu, Philippines where early and advanced stages of developing a MPA network have been completed, respectively. The research included field activities such as interviews and workshops with MPA management teams, local government officials, fishers, agencies, NGOs, stakeholders, and enforcement officers. This research has been published (Armada et al. 2009; Christie et al. 2009; Eisma- Osorio et al. 2009; Lowry et al. 2009). The results of this research and learning are being made accessible through this manual to the community of MPA managers.